As much fun as it will be unleashing your motion-detected fists of fury via PlayStation Move, nothing will ruin the illusion faster than hurling your controller through your TV screen. CTA Digital's glove peripheral will help keep the peace. Even though stronger television screens are on their way, the safety-minded fighting game enthusiast doesn't want to take any chances—but still wants to look like they live dangerously. 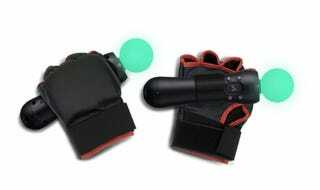 Little says bare-knuckle badass like velcro, and so the Ultimate Boxing Gloves feature snug-fitting velcro pouches to secure your Move controllers while you uppercut away. A whole second level of velcro-based security can be found in the adjustable wrist straps, ensuring that both glove and controller don't go flying off your frenzied hands. Should you still somehow manage to shatter your screen, the Ultimate Boxing Gloves are padded, so you can comfortably take out your rage on a nearby friend.